My friend Julie shared this recipe with me. Slice French bread into 20 slices, 1 inch each. Arrange slices in a generously buttered 9 by 13 inch flat baking dish in 2 rows, overlapping the slices. In a large bowl, combine the eggs, half and half, milk, sugar, vanilla, cinnamon, nutmeg and salt and beat with a rotary beater or whisk until blended but not too bubbly. Pour mixture over the bread slices. Cover with foil and refrigerate overnight. Grease a glass or ceramic 9-inch pie pan. Cover the bottom of the pie pan with a single layer of bread cubes, followed by ham, followed by cheese. In a bowl, beat the eggs, milk, dry mustard and salt until frothy and fully combined. Pour the egg mixture over the ingredients in the pie pan. Drizzle melted butter over top. Cover and refrigerate overnight. Bake, uncovered, at 325 degrees F for 45 minutes to an hour, or until the egg mixture is fully set and the top is golden brown. Preheat oven to 400º and spray a 12-cup muffin tin with cooking spray. Line each cup with a slice of ham and sprinkle with cheddar cheese. Crack an egg in each ham cup and season with salt and pepper. Bake until eggs are cooked through, 12 to 15 minutes. Spray saucepan with cooking spray and then sauté onions and ham together for about five minutes. Pour sauted ham and onions and shredded cheese into pre-made pie shell. Beat the eggs with heavy cream. When blended, pour it over the ham and onions and cheese mixture. Bake 35-45 mins until set. Let stand for ten minutes before cutting/serving in wedges. Serve with a tossed green salad and crusty French bread. This recipe is from Elaine. Beat eggs until smooth and lemon colored. Add remaining ingredients and blend until smooth. Pour into lightly greased 9×13 glass baking dish. Bake at 350 degrees for 35 to 45 minutes, until top is golden brown and center appears firm. Serve hot. Original recipe link, click here. Combine all ingredients in blender or food processor and process about 1 minute. Scrape down sides with rubber spatula and blend about 30 seconds more. Refrigerate for 1 hour. To cook, heat omelet pan, crepe pan, or skillet over medium-high heat–pan should be just hot enough to sizzle a drop of water. Brush lightly with melted butter. For each crepe, pour in just enough batter to cover bottom of pan, tipping and tilting pan to move batter quickly over bottom. 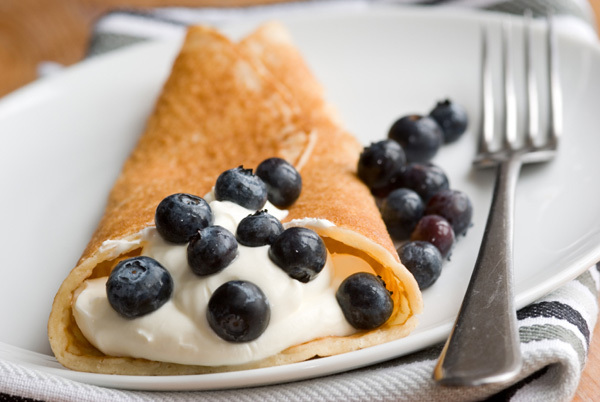 If crepe has holes, add a drop or two of batter to patch. Cook until light brown on bottom and dry on top. Remove from pan and stack on plate. Makes 12 crepes. 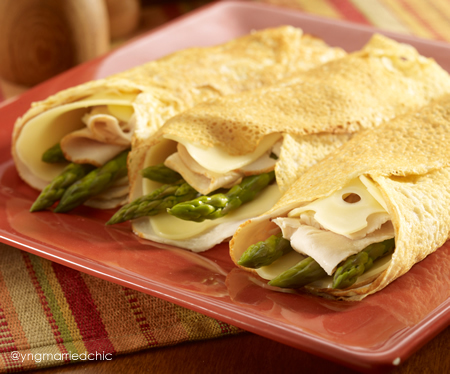 Note: If you are making crepes ahead to use for two meals, cut out squares of waxed paper or aluminum foil and place between crepes. Store on a plate in the fridge. I can’t believe I have never made waffles with bacon in them before. Now all I need is a waffle iron in the shape of the great state of Texas. Whisk egg yolks, milk and oil. Add flour, baking powder and salt. Stir just until combined. Batter will be lumpy. In separate bowl, beat egg whites until stiff peaks form. Fold egg whites into batter, being careful not to over mix. Sprinkle 2 tablespoons bacon onto preheated waffle iron. Pour batter on top of bacon. Sprinkle with another 2 tablespoons bacon. Close lid. Cook until golden.